CAN ELIANA PACO MAKE TRADITIONAL BOLIVIAN ATTIRE CHIC? CAN SHE MAKE TRADITIONAL BOLIVIAN ATTIRE CHIC? Because high fashion and traditional ways don’t always mix. 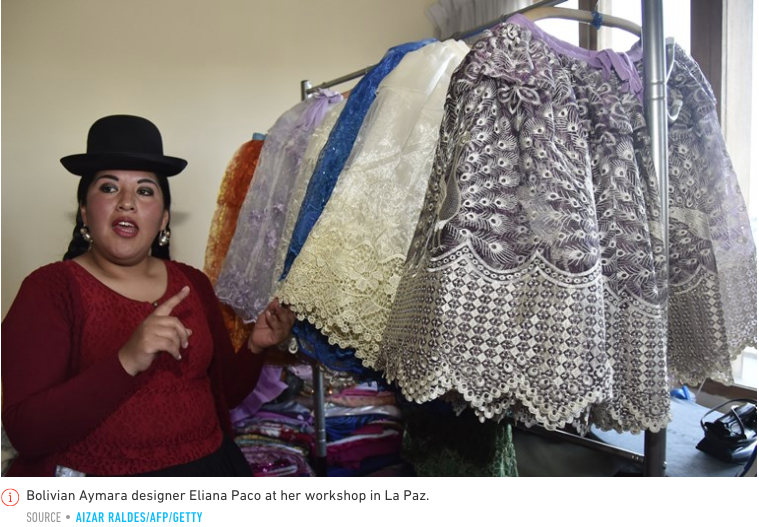 Eliana Paco’s mother has always worn the traditional clothing of the Chola Paceñas, as the Aymara women of La Paz are known, and she has worked sewing it and selling it within her community too. But she forbade her daughter from wearing the puffy skirt called a pollera, the embroidered tasseled shawl or the bowler hat that combine with long braids to form the chola ensemble. Originally imposed by the Spanish crown at the end of the 18th century as a way to identify women of indigenous blood and deny them their traditional clothing, the Chola Paceña attire has long served as grounds for discrimination against indigenous women. The term “chola” itself was derogatory. But lately there has been a resurgent pride in chola clothing, much of it because of the election of the nation’s first Aymara president, Evo Morales, in 2005, but some of it because of designers like Paco. After leaving her mother’s home when she married after high school, Paco not only began wearing traditional chola clothing, she started making it. Today, Paco’s elegant designs combine bright colors, modern textures, flashy details and elegant cuts with price tags as high as $2,000. Her designs have become a favorite among discerning cholas, and have graced runways as far away as New York. “Eliana Paco is a leader in what has been the revalorization of this attire. She has strengthened a sense of identity within the culture that uses it and generated appreciation for it outside of the culture and outside of the country,” says Micol Balderrama, who works for the office of cultural affairs in the municipality of La Paz, which has named Paco a cultural ambassador. Now, two years after that first international show, she moves seamlessly between her culture and the fashion world. In the La Paz neighborhood where there are dozens of modest shops selling polleras and shawls, where women sell food out of carts on the streets and men drink beer on the corner, Paco tends her well-appointed store. Inside, a long row of pastel-colored petticoats, which give the pollera its distinctive lift, form a lacey canopy over a long, black couch. On a recent evening, she stood behind her desk, wearing a subdued black pollera and a long, open black and gray sweater. She was holding an impromptu meeting with a handful of women who belong to a 120-member-strong pollera makers’ association that she presides over as president. Three evenings later, she was wearing a sequined shawl that featured a floral design and macramé, a black bowler hat, dangling earrings and a pollera at a fashion show in La Paz. After the show, she embraced the lanky models who had strutted her elegant designs down the runway to the beat of electronic music. She kissed fellow designers on the cheek and graciously received praise from other guests, as people milled about posing for pictures and pressing business cards into each other’s hands. But Paco’s crossover into this world has also drawn criticism. After Bolivia Fashion Week, Paco says she got flak for dressing a model in a pollera and high heels, instead of the flats favored by cholas. She also shows models in corsets using transparent fabrics and low or open necklines, as opposed to the traditional, high-necked blouse. 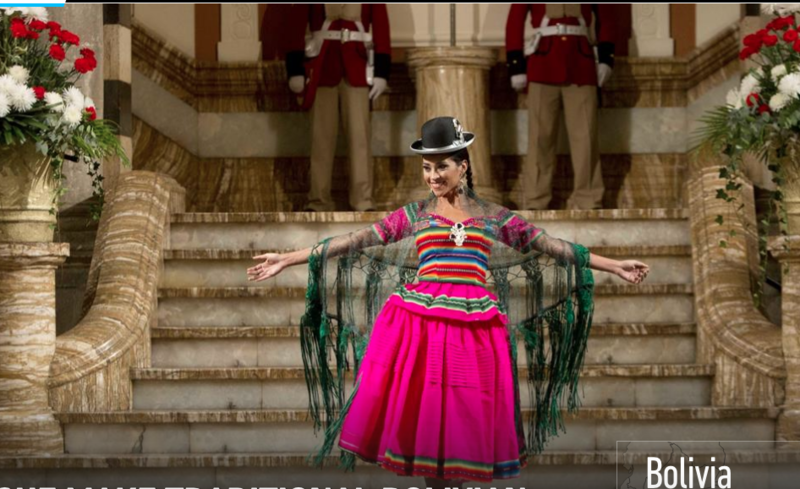 The municipality of La Paz recently outlawed these modifications for official festivities where cholas perform dances, in an attempt to preserve the authentic attire that the government has declared intangible cultural patrimony. According to Valeria Salinas, who teaches at the Private University of Bolivia and researches the chola fashion movement, “it is one thing to make the attire more fashionable and another to distort it.” Now, non-chola women are sparking complaints of cultural appropriation and talk of original versus “transformed cholas,” Salinas says. For Paco, who declined to reveal her age, fashion is not static, and modernizing chola style without breaking its traditional form and elements is a way to lure a reluctant generation of cholas back to the attire. When she dresses non-chola women in her designs — whether it is foreign diplomats stationed in La Paz or runway models — she sees it as a cultural exchange. And even the cultural purists at the municipality accept that Paco has more leeway on international runways to bend the limits of tradition. As Paco looks to the future, her eye is both on Bolivia and abroad. Domestically, she wants to promote shawls made of alpaca fiber and work with contacts in the local textile industry so that one day, she can design clothes from 100 percent Bolivian products. Her other goal is to rekindle the acquaintance she made at the fashion weeks in Bolivia and New York with designer Ágatha Ruiz de la Prada, a member of Spanish royalty, who Paco says was very supportive. Paco says her goal is to show her work in Europe and hopefully leave something of hers behind in the window of one of de la Prada’s boutiques in Spain. If she does, she will be taking attire forced by the Spanish on Bolivian women hundreds of years ago and giving it a triumphant return.